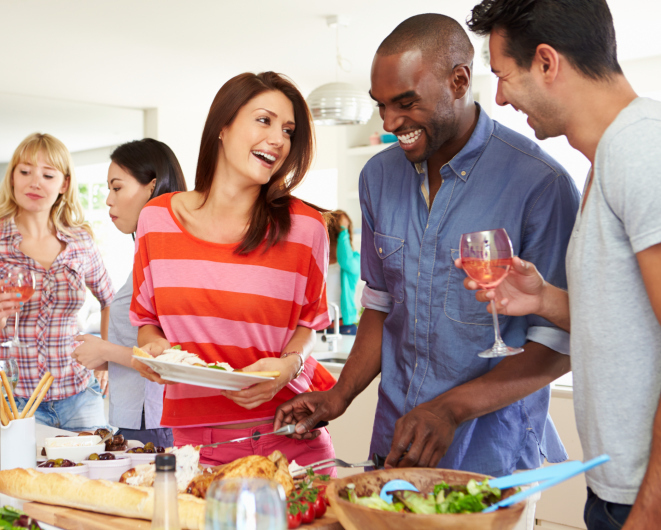 Potluck dinners can be a great way to start conversations between guests who may not know each other. Maybe this is your first holiday dinner party, or maybe you’re a seasoned dinner party hostess. But the season for holiday dinners and cozy indoor parties is upon us! Don’t let the compact space of your apartment deter you from hosting the best part possible. If you’re looking for some tips to make your next apartment dinner party a success, look no further! Make the dining room the focus of your space. Give yourself all the space you and your guests need by moving your dining room table into the largest room in your apartment and centering it in the room. If that means swapping your living room and dining room, do so. Consider creating a small, intimate seating area in the smaller room for people to lounge after dinner. Move unnecessary furniture out of the way by putting it around the edges of the room or by moving it into your bedroom for the evening. Mood lighting is an essential part of a dinner’s atmosphere. You want your apartment to appear welcoming and cozy. That can be difficult to do with fluorescent, overhead lighting. Better suggestions for lighting would be small lamps, tea lights, candles, and string lights. String lights are a versatile option because they can be draped and piled artistically throughout your apartment. They even come in a huge variety of shapes, which means you can customize your lighting for your specific celebration. Apartment kitchens are necessarily meant to great grand, seven-course meals. Instead, get your guests involved in the process. Invite them to bring a dish to contribute to the dinner, whether that be their favorite appetizer, dessert, or wine. Potluck dinners can be a great way to start conversations between guests who may not know each other. Looking for an St. Mary’s apartment? We can help! At The Apartments of Wildewood, located in beautiful in St. Mary’s Maryland, we offer homes with access to pools, an on-site gym, and maintenance whenever you need it – and have access to all the information you need to affordably rent a warm apartment in winter. To set up an appointment to check out an apartment rental from Apartments at Wildewood, call us at 301.737.0737or visit the website! This entry was posted on Friday, November 6th, 2015	at 10:06 pm	. Both comments and pings are currently closed.